How is an urban population defined? How is a slum household defined? How is urban density defined? This article was first published in September 2018. We&apos;d like to thank Diana Beltekian for great research assistance. More than half of the world&apos;s population now live in urban areas — increasingly in highly-dense cities. However, urban settings are a relatively new phenomenon in human history. This entry presents an overview of urbanization across the world, extending from the distant past, to present, and projections of future trends. Here we present a series of charts covering many aspects of urban shares, density, land area, and population sizes. The chart below, however, provides a snapshot overview of how the world has become — and is expected to continue to — more urbanized. It shows, for any given country, whether more people (the majority) live in urban or rural areas. Using the timeline feature and "play" button in the bottom-left of the chart, you can explore how this has changed over time. Also included are UN Urbanization projections to 2050. In 1950, it was predominantly high-income countries across Europe, the Americas, Australasia and Japan who were largely urban. A century later — in 2050 — it&apos;s projected that most countries will have more people living in urban areas than not. As we see, urban living is a very recent development. For most of our history humans lived in low-density, rural settings. Prior to 1600, it&apos;s estimated that the share of the world population living in urban settings did not reach 5 percent. By 1800, this share reached 7 percent; and by 1900 had increased to 16 percent. It was not until the 20th century that urbanization across the world began to increase rapidly. We zoom in on urban growth over the last 500 years later in this entry, followed by more recent trends from 1960 onwards. In the chart below we zoom in on these long historical trends to focus on the past 500 years. Data on urban shares dating back to 1500 are available only for select countries, with an estimated share at the global level. Here we see clearly again that urbanization has largely been confined to the past 200 years. By 1800, still over 90 percent of the global (and country-level) population lived in rural areas. Urbanization in the United States began to increase rapidly through the 19th century, reaching 40 percent by 1900.5 By 1950 this reached 64 percent, and nearly 80 percent by 2000. This rate of urbanization was, however, outpaced by Japan. Urban shares in Japan were low until the 20th century.6 By 1900, it had just surpassed 1-in-10. This increased rapidly, reaching over half of the population by 1950; nearly 80 percent by 2000, and surpassing the USA to over 90 percent today. China and India had not dissimilar rates of urbanization until the late 1980s.7 By then, both had around 1-in-4 living in urban areas. However, China&apos;s rate of urbanization increased rapidly over the 1990s, and 2000s. Over this 30-year period its urban share more than doubled to 58 percent. India&apos;s rise has continued to steadily rise to 1-in-3 (33 percent) today. In the sections above we looked at the long history of urbanization. The chart below zooms in on trends in urbanization over the past 50 years. Using the timeline in the map below you can view how the share of the total population living in urban areas has changed since 1960. Here we see that across most countries, urban shares have been increasing. The rate of change, however, varied significantly. Higher-income countries, particularly across Europe, North America and Australasia already had large urban populations in the mid-20th century. Most had more than half of their population living in urban areas, with some exceeding 80 percent. For countries with initally high urban shares, this rate of increase was relatively slow over the second half of the century. Urbanization across many low-to-middle income countries has increased rapidly over the last 50 years. Urban shares have more than doubled for many. In Nepal and Mali, for example, the share of people living in urban areas more than quadrupled; in Nigeria and Kenya, they more than tripled. Today the majority of countries have more people living in urban areas than in rural. Countries with lower rates tend to be focused across Sub-Saharan Africa, Asia-Pacific, and a handful in Latin America. How many people in total live in urban and rural areas? The chart below shows the urban and rural population from 1960 onwards. Using the "change country" function in the bottom-left of the chart, you can view this data across different countries and regions. Here we see that in 1960 there were twice as many people in the world living in rural settings (2 billion) versus urban (1 billion). Over the second half of the 20th century this gap closed, not as a result of absolute declines in rural population, but through rapid growth in urban areas. In 2007, rural and urban populations were approximately equal in size — both at 3.33 billion people. Since the crossing point in 2007, urban population has continued to increase rapidly whilst rural population has grown only marginally. In 2016 it&apos;s estimated that 4 billion people lived in urban areas, and 3.4 billion in rural. The past 50 years in particular have seen a rapid increase in rates of urbanization across the world. Are these trends likely to continue? The UN World Urbanization Prospects provides estimates of urban shares across the world through to 2050. These projections are shown in the chart below — using the timeline you can watch this change over time. Across all countries urban shares are projected to increase in the coming decades, although at varied rates. By 2050, it&apos;s projected that 68 percent of the world&apos;s population will live in urban areas (an increase from 54 percent in 2016). In fact, by 2050 there are very few countries where rural shares are expected to be higher than urban. These include several across Sub-Saharan Africa, Asia, Pacific Island States, and Guyana in Latin America. Why, when most countries are expected to be majority urban, does the global total just over two-thirds? This seems low, but results from the fact that many of the world&apos;s most populated countries have comparably low urban shares (either just over half, or less). For example, India (expected to be the world&apos;s most populous country), is projected to have an urban share of only 53 percent in 2050. In the chart below we see estimates of urban and rural populations in absolute terms, projected through to 2050. Projected population growth based on the UN&apos;s medium fertility scenario. As of 2018 we see that there is around 7.6 billion people in the world (4.2 billion in urban and 3.4 billion in rural areas). By 2050, global population is projected to increase to around 9.8 billion. It&apos;s estimated that more than twice as many people in the world will be living in urban (6.7 billion) than in rural settings (3.1 billion). These trends can be explored by country or region using the "change country" function in the bottom-left of the chart below. Using our timeline map of urbanization you can explore how countries are expected to transition from predominantly rural to urban in the coming decades. There we see that by 2050 it&apos;s projected that the majority of countries will have a majority (greater than 50 percent) of people living in urban areas. Quality of living standards in urban centres is of course an important measure of wellbeing. One metric of living standards is the share of the urban population living in slum households. A slum household is defined as a group of individuals living under the same roof lacking one or more of the following conditions: access to improved water, access to improved sanitation, sufficient living area, and durability of housing. The share of the urban population living in slums by country is shown in the chart below. This data is available from the year 1990. Here we see that in the latest data, most countries across Asia and Latin America had between 10 to 30 percent of urban populations living in slum households (some slightly higher). Slum households were most prevalent across Sub-Saharan Africa; most had more than half of urban populations living in slum households, and some (such as Sudan, South Sudan, and Central African Republic) had more than 90 percent. 77 to 50 percent in Nigeria. How many people are living in urban slums? In the chart below we see the total number of people living in urban slum households, and the urban population not living in slums. This is available to view by country using the "change country" option in the bottom-left of the chart below. Here we see that despite continued population growth and urbanization rates across most countries, the absolute number of people living in urban slum households has also been falling across many countries. A map of total number of people living in urban slum households by country is available to explore here. Although the definition of &apos;urban&apos; gives us some indication of population densities, it does not differentiate between those that live in small versus large urban settings. In the chart below we show the percentage of the total population which live in agglomerations greater than one million people (i.e. large urban agglomerations). These figures are available in absolute terms (the total number of people living in large urban settings), found here. Here we see large differences across the world. Smaller city-based nations such as Kuwait, UAE, Japan, Puerto Rico and Israel tend to have high rates of large urban agglomeration: more than half live in large cities. Across much of the Americas, 40 to 50 percent live in large urban agglomerations. Most other countries across Europe, Asia and Africa lie somewhere in the range of 10 to 40 percent. There are a few countries which have a very low prevalence of large cities — in Germany and the Netherlands, for example, less than 10 percent of the population live in cities over 1 million despite having large urbanisation rates. We can also look at this centralisation effect through the share of the urban population which lives in the single largest city. This is shown in chart below. Here we have a handful of countries — such as Mongolia, Paraguay, Uruguay, Liberia, Senegal and Afghanistan — where more than half of the country&apos;s urban population live in its largest city. Overall, this share tends to be higher in countries across Africa and Latin America; a share of 30 to 50 percent is common. Rates across Europe, Asia and North America are highly variable, ranging from over 40 percent to less than 10 percent. In the chart below we see the world mapped based on the population of each country&apos;s capital city. In 2018, Japan&apos;s capital — Tokyo — had the largest population of the world&apos;s capital cities at over 37 million people. This was followed by Delhi (India) at over 28 million; Mexico City (Mexico) at 21 million; and Cairo (Egypt) with 20 million. Across the world the most common capital size was in the range of 1 to 5 million people. Beijing in 1950, for example, had a population of 1.7 million. By 2015 this was more than 10 times higher, at more than 18 million. By 2035 it&apos;s expected this will increase further to 25 million. Dhaka (capital of Bangladesh) increased from less than half a million in 1950 to almost 18 million in 2015 (and projected to reach 31 million by 2030). Using the "change city" in the bottom-left of the chart below, you can browse trends for the largest 30 cities. In the chart below we show the relationship between the share of the population living in urban areas (y-axis) and average income (gross domestic product per capita) on the x-axis. Here we see a strong relationship between urbanization and income: as countries get richer, they tend to become more urbanized. child malnutrition is lower in urban settings. Note, however, that it is difficult to infer causality between urbanization and these examples. Since urbanization shows a strong correlation with income, such relationships may instead simply show the effect of higher incomes on electricity access, sanitation, drinking water and nutrition. Furthermore, there can also be significant inequalities within urban areas; this is evidenced by the fact that across many low-to-middle income countries a high share of the urban population live in slum households (which lack access to all of the basic resources). In the chart below we see the share of people employed who are in agriculture (y-axis) versus the share of the population living in urban areas. Here, in general, we see that agricultural employment tends to decline with urbanization. In our blog post &apos;Structural transformation: how did today&apos;s rich countries become &apos;deindustrialized&apos;? we discuss and look at the data on this agriculture-industry-services shift in more detail. Although this agriculture-urbanization link tends to hold true for most countries, there are a couple of clear outliers. Sri Lanka, Samoa, and Barbados, for example, appear to show relatively low levels of agricultural employment despite being predominantly rural. For Sri Lanka, this anomaly is explained by low urbanization rates, rather than relatively low levels of agricultural employment — a labour share of just under 30 percent in agriculture is not dissimilar for neighbouring countries in the Asia-Pacific region. In the case of Barbados and Saint Lucia: low agricultural production and employment is common for many small island states. In the chart below, we have mapped the minimum threshold level of the number of inhabitants in a settlement needed for it to be classified as an &apos;urban area&apos;. The data shown for a given country is its nationally-defined minimum threshold. When we look at the frequency at which a given threshold level is used by a country, we see that 2000 and 5000 inhabitants are the most frequently adopted (by 23 countries each). However, these ranges vary widely: Sweden and Denmark, for example, use a threshold of only 200 inhabitants whereas Japan adopts a very high threshold of 50,000 inhabitants. Note that 133 countries do not use a minimum settlement population threshold in their &apos;urban&apos; definition. Some use a variation of population density, infrastructure development, pre-assigned city populations, or in some cases no clear definition. The UN adopts national definitions in its reporting of urban versus rural populations. This means urban populations are often not comparable across countries. Global urbanization trends also encounter this issue: world urban population is reported as the sum of nationally-defined urban populations (therefore summing metrics/thresholds which are not directly comparable). 1. Durable housing of a permanent nature that protects against extreme climate conditions. 2. Sufficient living space which means not more than three people sharing the same room. 3. Easy access to safe water in sufficient amounts at an affordable price. 4. Access to adequate sanitation in the form of a private or public toilet shared by a reasonable number of people. 5. Security of tenure that prevents forced evictions. It should be noted that although a single categorisation of a &apos;slum household&apos; is given, the conditions and level of deprivation can vary significantly between slum households. Some households may lack only one of the above criteria, whereas others may lack several. The density of a geographic area is measured on the basis of the average number of people per unit of area (for example, the number of people per square kilometre, km2). It&apos;s therefore calculated as the population divided by the land area for that given population. But what does urban density mean? Here, again, we encounter the difficulty in agreeing on the standard boundary definition of what constitutes an urban area. The standard metric adopted (and encouraged) by the UN for urban density is the so-called "urban agglomeration population density". 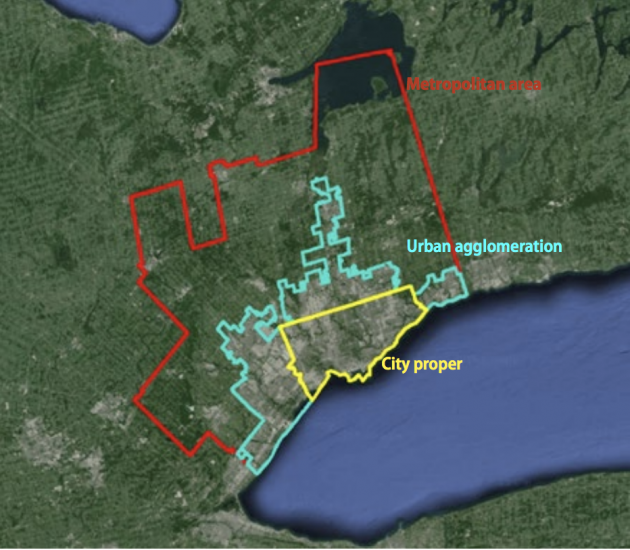 The term “urban agglomeration” refers to the population contained within the contours of a contiguous territory inhabited at urban density levels without regard to administrative boundaries. It usually incorporates the population in a city or town plus that in the suburban areas lying outside of, but being adjacent to, the city boundaries. Whenever possible, data classified according to the concept of urban agglomeration are used. However, some countries do not produce data according to the concept of urban agglomeration but use instead that of metropolitan area or city proper. If possible, such data are adjusted to conform to the concept urban agglomeration. When sufficient information is not available to permit such an adjustment, data based on the concept of city proper or metropolitan area are used. The figure below, which shows the urban definition boundaries for Toronto is used by the UN to demonstrate these differences.19 Here we therefore see that the most commonly used definition of "urban agglomeration" is based on the population and area size of the central city or town plus its close suburban sprawls. Figures on total land area report an area of 9.15 million km2. 157,000 as a percentage of 9.15 million equates to approximately 1.7 percent [157,000/9150000*100]. Figures on total land area report an area of 2.97 million km2. 24,000 as a percentage of 2.97 million equates to approximately 0.8 percent [24,000/2970000*100]. Kuroda (1984). Urbanization and Development in Japan. The Asian Population and Development Association. Available at: http://www.apda.jp/pdf/p04_jinkou_series/popdev_series_3_en.pdf. Bairoch (1988). Cities and Economic Development. University of Chicago Press, Chicago. Projections through to 2035 are published by the UN World Urbanization Prospects (2018) based on its medium fertility scenario of population growth and urbanization rates. C. M. Becker, in International Handbook of Development Economics, A. Dutt, J. Ros, Eds. (Edward Elgar Publishing, Northampton, MA, 2008). Henderson, V. (2003). The urbanization process and economic growth: The so-what question. Journal of Economic Growth, 8(1), 47-71. Available at: https://link.springer.com/article/10.1023/A:1022860800744. Ciccone, A., & Hall, R. E. (1993). Productivity and the density of economic activity (No. w4313). National Bureau of Economic Research. Available at: http://www.nber.org/papers/w4313. Montgomery, M. R., Stren, R., Cohen, B., & Reed, H. E. (2013). Cities transformed: demographic change and its implications in the developing world. Routledge. Available at: https://www.taylorfrancis.com/books/9781134031665. Black, D., & Henderson, V. (1999). A theory of urban growth. Journal of Political Economy, 107(2), 252-284. Available at: https://www.journals.uchicago.edu/doi/abs/10.1086/250060. Michaels, G., Rauch, F., & Redding, S. J. (2012). Urbanization and structural transformation. The Quarterly Journal of Economics, 127(2), 535-586. Available at: https://academic.oup.com/qje/article/127/2/535/1824278. United Nations (2017). The World's Cities in 2016. United Nations Population Division. Available at: http://www.un.org/en/development/desa/population/publications/pdf/urbanization/the_worlds_cities_in_2016_data_booklet.pdf.